Dog people are doing more and more to make their pets comfortable, from booking a loving pet sitter to making homemade treats. 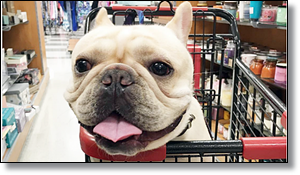 Bringing their dog along to the store is a natural extension of the dog-centric lifestyle! Shopping with a friend is more fun than shopping alone, period. However, it can be hard to tell what a store’s dog policy is (and it often varies by location). For example, is Target dog-friendly? Their mascot may be the beautiful bull terrier Bullseye, but they’re a staunch “service dog-only” environment (along with Sears, Staples, and others). Thankfully, dog-friendly stores are increasing in number. Note: due to regulation, grocery stores aren’t dog-friendly and food-serving establishments typically don’t allow dogs indoors. If you want to dine out with your dog, look for a location with a patio. Many restaurants welcome dogs in their outdoor spaces. Consider the Starbucks dog policy. Though Starbucks doesn’t allow dogs inside stores, they welcome dogs outside—and even offer them a tasty “puppuccino” if you ask! Now, let’s talk dog-friendly shopping.